Lighthouses for Kids features 21 diverse activities. 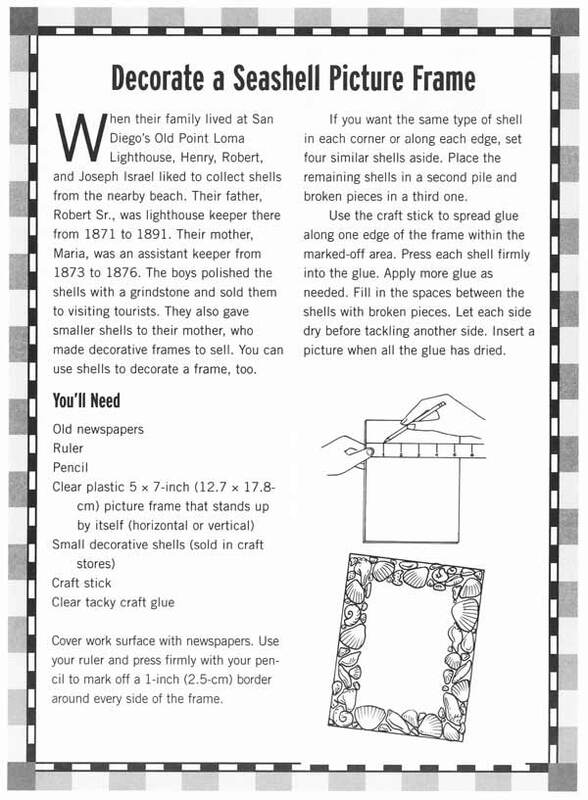 Readers can build a model lighthouse that lights up, make a keeper’s cap, investigate how lighthouses flashed long ago and decorate a lighthouse cake, among others. When their family lived at San Diego’s Old Point Loma Lighthouse, Henry, Robert, and Joseph Israel liked to collect shells from the nearby beach. Their father, Robert Sr., was lighthouse keeper there from 1871 to 1891. Their mother, Maria, was an assistant keeper from 1873 to 1876. The boys polished the shells with a grindstone and sold them to visiting tourists. They also gave smaller shells to their mother, who made decorative frames to sell. You can use shells to decorate a frame, too. Cover work surface with newspapers. Use your ruler and press firmly with your pencil to mark off a 1-inch (2.5-cm) border around every side of the frame. If you want the same type of shell in each corner or along each edge, set four similar shells aside. Place the remaining shells in a second pile and broken pieces in a third one. Use the craft stick to spread glue along one edge of the frame within the marked-off area. Press each shell firmly into the glue. Apply more glue as needed. Fill in the spaces between the shells with broken pieces. Let each side dry before tackling another side. Insert a picture when all the glue has dried. The White House for Kids features 21 cross-curricular activities designed to teach readers about the historic house and the lifestyles of first families—past and present. The book includes instructions for building a model White House, designing a White House china pattern, playing a simple arrangement of “Hail to the Chief,” and making White House fruit punch, among others. Why Is the President’s House White? Many Americans have learned that the White House got its name after the War of 1812. 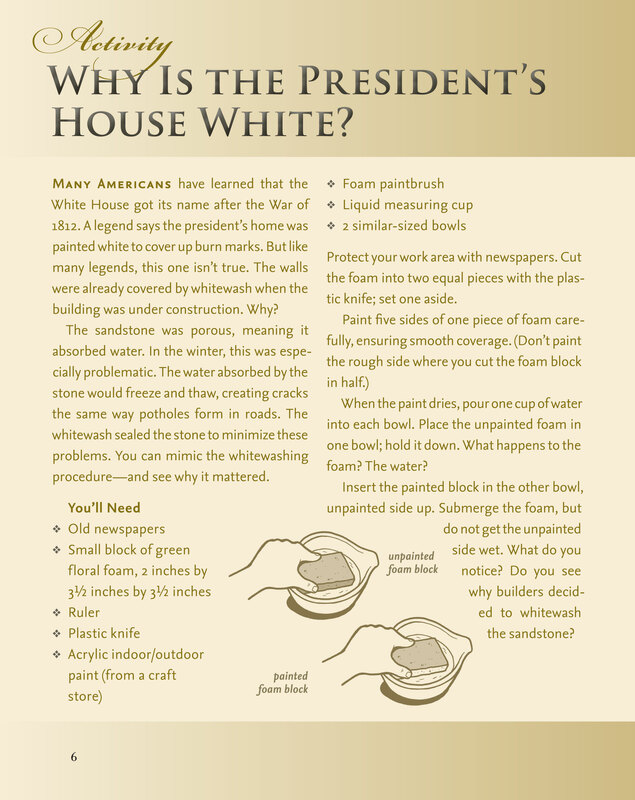 A legend says the president’s home was painted white to cover up burn marks. But like many legends, this one isn’t true. The walls were already covered by whitewash when the building was under construction. Why? The sandstone was porous, meaning it absorbed water. In the winter, this was especially problematic. The water absorbed by the stone would freeze and thaw, creating cracks the same way potholes form in roads. The whitewash sealed the stone to minimize these problems. You can mimic the whitewashing procedure—and see why it mattered. Protect your work area with newspapers. Cut the foam into two equal pieces with the plastic knife; set one aside. When the paint dries, pour one cup of water into each bowl. Place the unpainted foam in one bowl; hold it down. What happens to the foam? The water? Insert the painted block in the other bowl, unpainted side up. Submerge the foam, but do not get the unpainted side wet. What do you notice? Do you see why builders decided to whitewash the sandstone?